After 5 years of trial and error, This summer I finally made a self bow from Osage Orange that I felt could do the job. All my bows I've made have been shooters but did not have the speed or accuracy I needed to feel confident while hunting. I finally figured it out! Here is my story,,,, It was well worth the cost as you will see! The bows specs are Osage Orange wood self bow,62" lenght #70 @ 28" draw. Chronographed speed of 178 FPS. Averaged shooting on known range, 6" groups at 20 YRDS.It has a blacksnake skin backing with whitetail deer antler overlay limb tips. Left hand shelf design with a leather stitched handle. Hand twisted 12 strands of dacron B-50, flemish string is endless loop on one end and I use a timber hitch knot on the bottom limb. Beaver balls for string silencers. Brace hieght is 6 3/4". Finish is spare urethane clear. Leather single arrow quiver. Tree was cut, split into staves and sealed in the winter of 2003, with the help of a friend. 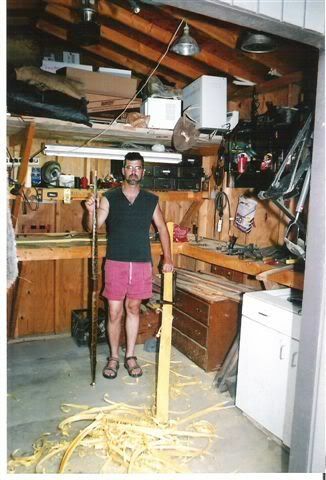 Summer of 2004 bow was created from stave and tillered by myself. Blacksnake skins are from two blacksnakes I caught while turkey hinting in the spring of 2004, Salt/Air cured and glued on back of bow. Whitetail antler tip overlays are from deer harvested by myself in past seasons. String was twisted by myself using modern style dacron B-50 string material. Leather handle material was bought at a flea market and stitched on with the string material used in the bows string. Beaver balls were purchased on ebay. ARROWS: 12, Raw cedar shafts, spined at 65-70 lbs were purchased on ebay and were stained, crested and taperred by me. Two Blade Points were bought at 3 rivers archery and were the cheapist ones they had. I had to sharpen them myself. Modern knocks and feathers were purchased and I glued them on. Less than $40.00 total cost for these arrows! Less Than $100.00 in the total cost of components used to harvest two whitetailed deer,I Buck and One doe. WELL WORTH THE COST! Especially when you consider the following memories I now have for the rest of my life. THE HUNT #1: After practicing for a solid month every evening, I was grouping arrows at all ranges within my twenty five yard limit. I felt confident in my skills and was ready for opening day. Oct. 2nd, it rained all morning and I saw nothing. Went home to dry out and when I returned at 4:00pm my brother and his buddy was there to hunt with there compounds, state of the art I might add! They were poking fun at my "stick and string" as they called it. Finishing My last drink from an Aquafina water bottle I offered then the same shot by tossing the bottle out about 15 yrds and when it hit the ground, I drew back and center punched the bottle before they even knocked an arrow. I just got lucky but they didn't know that so I stuck out my chest and walked away to my stand. I settled into my stand. After an hour I saw a little tail flickering in the brush 50 yrds from my stand. The tail dissapeared and a few minutes later a small doe was standing infront of my stand on an old hull raod that was level with my stand. Eighteen yards away,,, and level, I could not pass the shot up. It was a perfect heart shot the arrow passed through completely and the doe ran only 35 yards and crashed. It was a small doe, but when the compound hunters came out of the woods and I was the only one that had harvested a deer. IT WAS A GREAT FEELING! The Stick and string had prevailed. Even though this was a small doe I felt like I had accomplished my goal,(To take a deer using equipment I made Myself)I had made that goal for myself 5 years ago! THE HUNT #2: Peak of the rut 6:00am the first Sunday in November. I met my freind (a compound hunter)at our honey hole. I could only hunt until 9:00am because I had to run my son to work. My buddy forgot his tree steps, so I offered to go home and let him hunt my stand. He said he would just go to another stand that he didn't need steps for. I decided to stay. I got to my stand and before I could get my bow pulled up I saw a doe coming fast towards my stand. I quikly rasied the bow and knocked an arrow. Here she came right at me out of the thicket. Then I saw horns coming the same way. I new he was on a hot one. If I could get her by me the buck would step out of the thicket right where she came out. The doe stopped just to my left and I could tell out of the corner of my eye she was looking back in my direction. The buck steps out and stops broadside 12 yards from my tree. As I drew back the doe blew and my shot hit the buck to low just shaving the wite belly hair off. He ran about ten yards and I took another shot quatering away,,, I missed by inches. He just walked off in the direction the doe had gone. I was so sick,,, It was a real nice tall tined 8 point about 15' wide. As I started to sit back I heard several grunts coming from the same thicket the other deers had come from. As soon as I saw the rack I knocked another arrow and stood another arrow upright in my seat leaning against the tree, JUST INCASE! I knew he was on the hot does trail and I knew were he was coming out,,, I WAS READY! He stepped out in the exact same spot as the first buck, I mouth grunted and he stopped broadside. I drew back and let her fly! It was a good hit , just a little further back than I'd have liked. He only ran 15 yards and my second arrow was ready when he stopped. Damned if I didn't miss. The buck then ran another twenty yards to the edge of the power line that runs up the hill. He then hunkered up and layed down. I could not believe I hade just harvested a nice 8 point buck after all that had happened that morning. Twenty minutes later there was no more movement and I slipped over to see my Buck,,,, YEEHAA!!! This all would have not been possible if the TRAD GANG did't keep me pumped up about traditional ways,,, I thank all of you! I would also like to thank people like Jim Hamm. Dean Torges, George T., The Ferret and a list of other bowyers that have inspired and informed me with the knowledge of their skills,,, I THANK ALL OF YOU! EVERYONE,,,Thanks for taking the time to read this story of mine. P.S. I sure hope I can get these pics up! I have more pics of the bow close up and under construction if anyone is interested I'll post them? Re: 1st Homemade Osage Bow, Whitetail Harvest! maybe you can see these pics? A hearty congradulations to you!!!! Nice Job...on the bow and the deer! 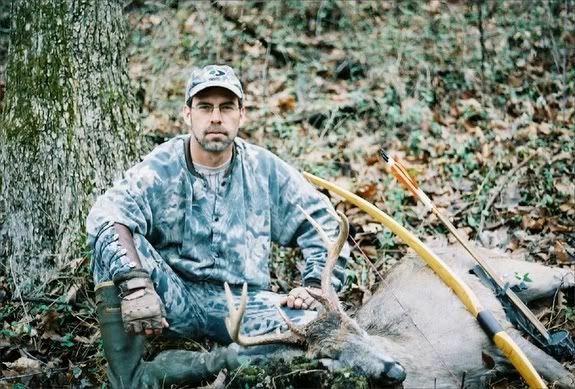 Your hooked for sure now,,the first bow or deer are always the hardest. Again , Congrats and thanks for sharing the stories and pictures. Ya done good Joe! Congrats!